Editor’s Pick: Petite Celebrities Eva Longoria and Kerry Washington petite fashion style watch! 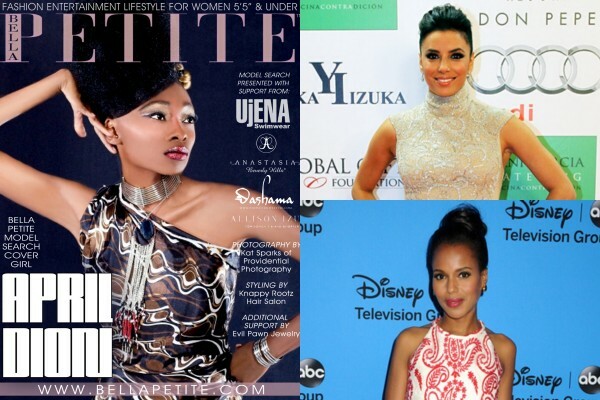 Bella Petite Magazine on petite celebrity style watch! Who’s got the look? Star sightings with Eva Longoria and Kerry Washington! Become part of the fashion scene join us and become a model member by entering the Bella Petite Model Search. Splendidly petite Eva Longoria (5’1″) was on the red carpet at the 2013 Global Gift Gala. The petite actress shimmered in a sheath sleeveless embellished gold Reem Acra column gown and diamond jewelry. Fashionable petite celebrity Kerry Washington (5’3″) is keeping cool this Summer. The mixed red pattern Giambattista Valli dress was a standout. Smartly Washington kept her accessories neutral, with taupe pumps and a gray clutch. Who’s got the winning look Eva Longoria and Kerry Washington? Tell us below. THE 2014 BELLA PETITE MODEL OF THE YEAR IS GOING TO HOLLYWOOD ALL EXPENSES PAID! 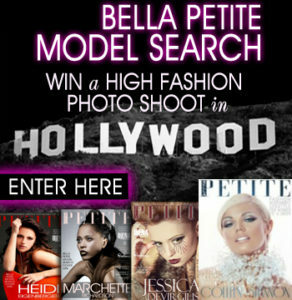 BELLA PETITE MAGAZINE Enter the Bella Petite Model Search WIN an all expense paid trip to Hollywood and a high fashion photo shoot and spread in Bella Petite!